EUR/USD remains pressured in a low range in the wake of the new week. Negotiations around trade, the government shutdown, and Brexit are stuck. The four-hour chart shows oversold conditions which may limit the falls. 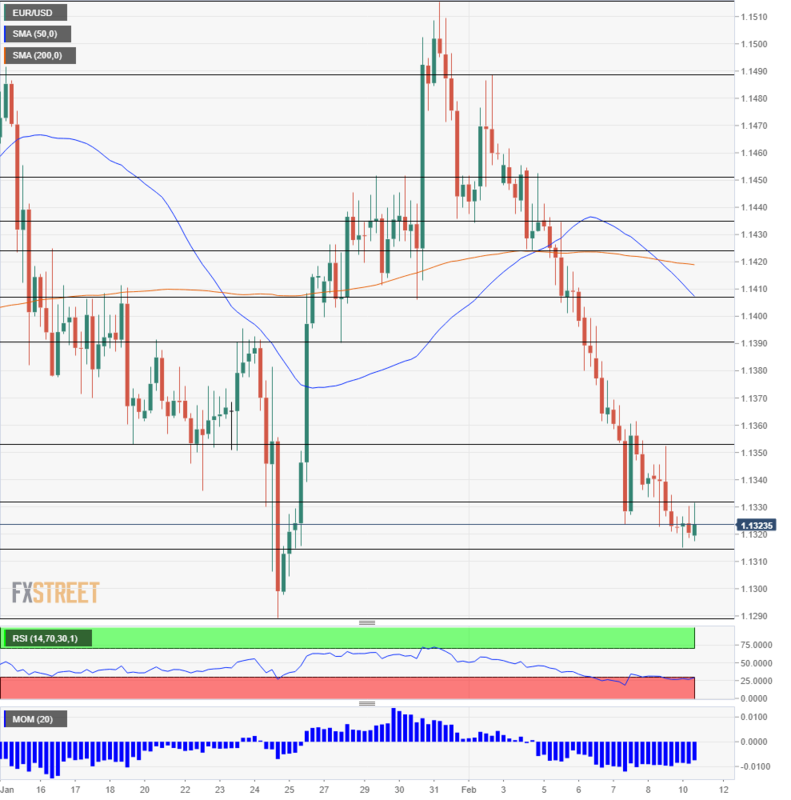 EUR/USD is trading around in the lower 1.1300s, unable to stage a recovery after a downward week. Concerns about lower growth are reflected in falling yields of German bonds, which near 0% on the benchmark 10-year notes. In addition, three sets of negotiations remain stuck and weigh on the mood. Trade: US Trade Representative Robert Lighthizer meets Chinese PM Liu He in Beijing for intense talks ahead of the March deadline. China offers buying US products but does not budge on intellectual property. On the other hand, speculation about a summit between Chinese President Xi Jinping and his American counterpart Donald Trump have reemerged once again, providing some hope. Government shutdown: Republicans and Democrats extended talks to avoid a new government shutdown when the current reopening expires on Friday. The discussions, held over the weekend did not succeed as the parties remain apart on immigration issues. Trump blamed Democrats for stubbornness due to a "bad week." Brexit: While the effect on the euro is not as significant as on the pound, the clock is ticking toward March 29th, Brexit Day, with no solution in sight. UK Brexit Secretary Steven Barclay travels to Brussels to meet Chief EU Negotiator Michel Barnier. Expectations are low. Philip Lane will likely be nominated as the Chief Economist at the European Central Bank. The Irish central banker is the only candidate to replace Peter Praet who is retiring. Lane is considered close to President Mario Draghi. Without any substantial economic releases on both sides of the Atlantic, developments on these three fronts are set to shape trading today. The Relative Strength Index on the four-hour chart is below 30, indicating oversold conditions. This development implies a bounce in the pair, but movements are limited. Momentum remains to the downside, and the 50 Simple Moving Average crossed the 200 one, a bearish sign. Immediate support is around 1.1315, the fresh two-week low. The 2019 trough at 1.1290 is next down the line and is closely followed by 1.1270, a double-bottom dating back to December. 1.1215 was 2018 low and provides further support. 1.1330 capped the pair in the past few hours and serves as the immediate line of resistance. 1.1355 was a swing high on Friday and also worked as support in mid-January. 1.1390 was a swing low in late January and switches to resistance. 1.1405 is another swing low from that time, and it coincides with the 50 SMA.